In summary, Cristobal (72 yrs. old) was from Spain, but was born and raised in Mexico. He came to Tucson in 1924, and at the Alianza Hispano-American, contracted the services of Perfecto Salazar, a Spanish-speaking American and former resident of Florence, as an interpreter to help him find records in Pinal and Maricopa counties of rich mines in the Superstitions his family used to operate there. 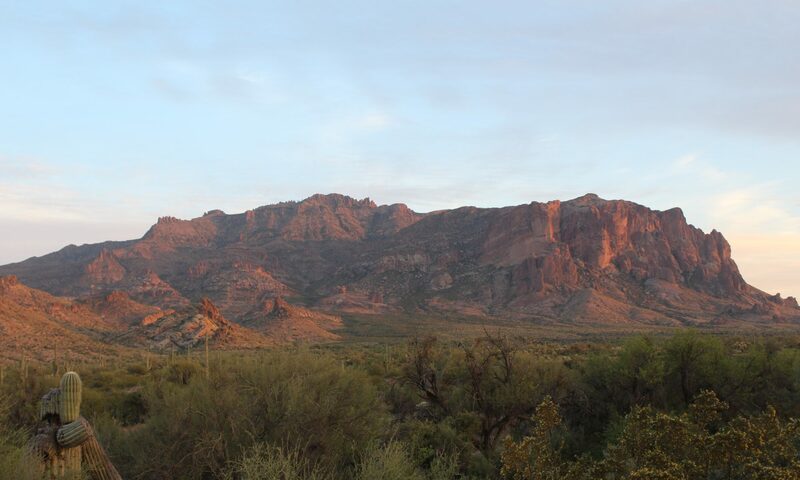 After days of research, Cristobal drove Salazar from Phoenix to the Superstition mountains to visit the area where the mines were located. They “pulled over, several miles” north of Apache Junction on Roosevelt Road (later to become the Apache Trail and Highway 88). Cristobal then shared a story that described members of the Peralta family undertaking a clandestine expedition in the winter of 1853-54 to mine for gold one more time and hide the mines (once again). 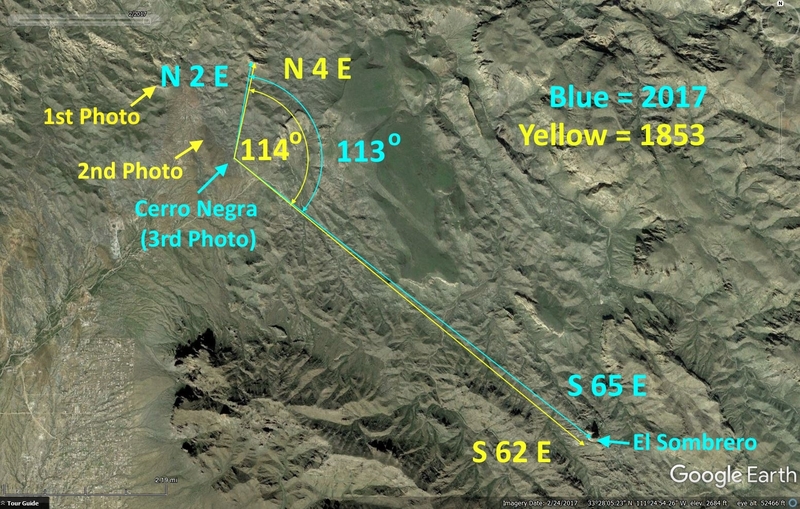 They used surveying equipment to survey the mine location and the area, and they took small photographs of the mine site from varying distances (including one from high ground near the mine) with “El Sombrero” in the background of all of them. Cristobal then showed Salazar 3 glass photos and a detailed map of the Superstitions area (and the location of the mine) that included 4 Peaks, the Salt River, and the area extending to the Gila River. Later, Salazar said that he wrote down on a brown paper bag some of what he saw on the map, and later apologized that he did not remember more. “The map, Peralta explained, was a survey of the mine site. The bearings and distances were referenced to the salient pinnacle, El Sombrero. In particular, a line ran northward from the pinnacle, accompanied by the numbers 4 and 62. There was also a transverse line running between three red hills and a two-room cave. A notation indicated that the pinnacle was 14 kilometers south of the Rio Salado. The meridian of reference for the survey was determined by an observation of Polaris, the north star, on the night of April 13th, 1854. It was important Peralta asserted, that the survey be done on the exact day of the year, so that the stars would occupy the same positions in the heavens as they did in the heavens as they did at the time of the original survey”. “The mines were then carefully closed and concealed, lest they fall into the hands of the “Yanquis” who have taken this area without any benefit of right”. • An accurate map in 1853, aligned with true north, could have been created by using a baseline that was derived from the sun or Polaris. But, it does not matter what date or time the north star is shot with a transit if an ephemeris or an alternate method Clay described is used to get a baseline for the survey. • To find a specific location in no-man’s land, a scaled map with reference to north is all that is needed if landmarks are marked on the map and they can be seen. Apparently, that is what Salazar got to look at. But if you do not have a map, or do not want to continually drag it out, the bearings to 2 known landmarks from the unknown location are needed. Where imaginary lines created by those bearings intersect is the referenced location. It is apparent that Cristobal had both of these methods to choose from. • It is apparent by reading the article that there was anti-American sentiment displayed by Salazar in 1924 considering comments about “Yanquis”, and the Mexican American war. After some research, it is unlikely the Alianza Hispano-American organization he was a member of in 1924 displayed the American flag in their lodges. Salazar surely did not want an American to find the mine. • Salazar was picked because of his knowledge of the Superstitions area, his skill as an interpreter, and someone befitting a visiting dignitary. He appears to have been very intelligent. • The small photos had to have some value, or Cristobal would not have brought them. Weaver’s Needle looks like a sombrero only in a very narrow band extending to the northwest from the Needle. Salazar said El Sombrero was in the background of all of the photos. While driving north on Highway 88 from Apache Junction, the full El Sombrero can be seen for only one brief instant, and is not able to be seen again until reaching the Needle Overlook (and it looks like a sombrero there). It is proposed that the Needle Overlook is where Perfecto and Cristobal pulled off and stopped the car. It was thought the numbers 4 and 62 are the numerical portions of quadrant bearings from the mine to known landmarks. Lewis and Clark used quadrant bearings, and they were common even 50 years ago. So, if 4 and 62 are references to quadrant bearings, where would they radiate from, and where would they pointing to? These would be the bearings shot from Cerro Negra and are referencing El Sombrero and the tiny hole through the mountain that can be seen along First Water road just as the sun comes up (photo below). Note: This is the same tiny hole that is indicated on the “Trail Stone Map” of the Peralta Stone maps. 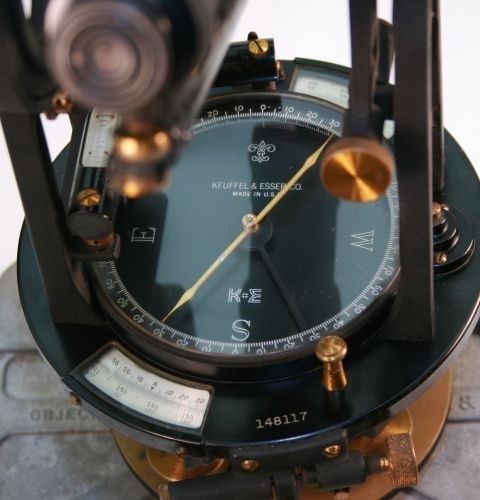 It was presumed that these bearings were based on magnetic north, because if someone was giving these bearings for in-house use, the bearing would be used with a compass without the complications of calculating declination (the angle between true north and magnetic north). Using Google Earth, it appeared the hunch may be true. To validate the bearings from 1853 and take actual bearings, a Brunton “pocket transit” (photo below) was taken to Cerro Negra. These do not match the S 62 E and N 4 E exactly, but the change in declination has to be taken into account. NOAA data gives declination for 1853 for Cerro Negra at 13 degrees E, and for 2017, 10 degrees E.
If the declination moved 3 degrees west between 1853 and 2017 as NOAA indicates, the bearings that Salazar partially described would EXACTLY match the bearings shot recently from the top of Cerro Negra if adusted for the declination change over time (rotated counterclockwise). The bearing to the hole through the mountain be off by only one degree. This is within the margin of error of the Brunton compass. As expected, the arcs swung between the landmarks in 1853 and 2017 are almost EXACTLY the same (off by one degree). This is damning evidence that the bearings from 1853 and 2017 reference the same landmarks. • Mr. Salazar seems to have developed a case of selective amnesia regarding what he saw on the map Cristobal showed him. Amnesia created by money, loyalty, sworn oath, or dislike of Americans because of the Mexican American War? • It is highly likely that Cristobal Peralta walked to Cerro Negra and the mines. It is an easy 15 minute hike up a flat wash to Cerro Negra from where the end of the Needle Overlook sidewalk is today. • This has been known to the writer for some time, and the compass bearings reinforce the issue: The Peralta mines are not in the wilderness area. They are not in exceedingly rough terrain. And, the orebodies are not primarily quartz. Photo #2 This is Cerro Negra on the S 65 E bearing. This is the most obvious of the VMS deposits on the property, and is a VMS orebody formed beneath basalt. There are no annotations needed for this photo. Photo #3. This is El Sombrero at S 65 E taken from Cerro Negra. Below is a transit from the 1940’s that uses quadrant bearings. The author learned to survey with one of these, doing all calculations with a hand calculator. It is believed that the Peralta mines were mostly underground in the later years of operation, and they were under the basalt in and nearby Cerro Negra. Note: Over one year later after this article was written, it was discovered that the bearings do not just reference a hill, but a MINE. This is described on the “Great Mine” page.